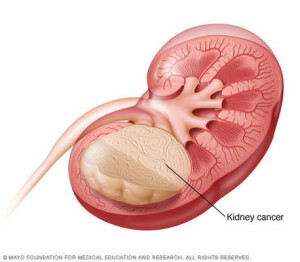 Kidney cancer is cancer that originates in the kidneys. Your kidneys are two bean-shaped organs, each about the size of your fist. They're located behind your abdominal organs, with one kidney on each side of your spine. In adults, the most common type of kidney cancer is renal cell carcinoma. Other less common types of kidney cancer can occur. Young children are more likely to develop a kind of kidney cancer called Wilms' tumor. The incidence of kidney cancer seems to be increasing. One reason for this may be the fact that imaging techniques such as computerized tomography (CT) scan are being used more often. These tests may lead to the accidental discovery of more kidney cancers. It’s not clear what causes renal cell carcinoma. Doctors know that kidney cancer begins when some kidney cells acquire mutations in their DNA. The mutations tell the cells to grow and divide rapidly. The accumulating abnormal cells form a tumor that can extend beyond the kidney. Some cells can break off and spread (metastasize) to distant parts of the body. Older age. Your risk of kidney cancer increases as you age. Smoking. Smokers have a greater risk of kidney cancer than nonsmokers do. The risk decreases after you quit. Obesity. People who are obese have a higher risk of kidney cancer than do people who are considered average weight. High blood pressure (hypertension). High blood pressure increases your risk of kidney cancer. Treatment for kidney failure. People who receive long-term dialysis to treat chronic kidney failure have a greater risk of developing kidney cancer. Certain inherited syndromes. People who are born with certain inherited syndromes may have an increased risk of kidney cancer, including those who have von Hippel-Lindau disease, Birt-Hogg-Dube syndrome, tuberous sclerosis and familial papillary renal cell carcinoma. Start by seeing your family doctor or a general practitioner if you have signs or symptoms that worry you. If your doctor suspects you may have kidney cancer, you may be referred to a doctor who specializes in urinary tract diseases and conditions (urologist) or to a doctor who treats cancer (oncologist). Because appointments can be brief, and because there’s often a lot of ground to cover, it’s a good idea to be prepared. Here’s some information to help you get ready and what to expect from your doctor. Consider taking a family member or friend along.Sometimes it can be difficult to remember all the information provided during an appointment. Someone who accompanies you may remember something that you missed or forgot. Do I have kidney cancer? Has my kidney cancer spread beyond my kidney? Can my kidney cancer be cured? Is there one treatment option you feel is best for me? If your friend or family member were in my situation, what would you recommend? Should I see a specialist? What will that cost, and will my insurance cover it?Are there brochures or other printed material that I can take with me? What websites do you recommend? In addition to the questions that you’ve prepared, don’t hesitate to ask additional questions that may occur to you during your appointment. Blood and urine tests.Tests of your blood and your urine may give your doctor clues about what’s causing your signs and symptoms. Stage II. A stage II kidney cancer is larger than a stage I tumor, but it’s still confined to the kidney. Together, you and your treatment team will discuss your kidney cancer treatment options. The best approach for you may depend on a number of factors, including your general health, the kind of kidney cancer you have, whether the cancer has spread and your preferences for treatment. When nephron-sparing surgery is possible, it’s generally preferred over radical nephrectomy since retaining as much kidney tissue as possible may reduce your risk of later complications, such as kidney disease and the need for dialysis. Treatment to freeze cancer cells (cryoablation). During cryoablation, a special needle is inserted through your skin and into your kidney tumor using X-ray guidance. Gas in the needle is used to cool down or freeze the cancer cells.There are few long-term data about the safety and efficacy of cryoablation for kidney cancer. It’s typically reserved for people who can’t undergo other surgical procedures and those who have small kidney tumors. Treatment to heat cancer cells (radiofrequency ablation).During radiofrequency ablation, a special needle is inserted through your skin and into your kidney tumor using X-ray guidance. An electrical current is run through the needle and into the cancer cells, causing the cells to heat up or burn. There are few long-term data about the safety and efficacy of radiofrequency ablation for kidney cancer. Radiofrequency ablation may be an option for people who can’t undergo other surgical procedures and those with small kidney tumors. Surgery to remove as much of the kidney tumor as possible. Even when surgery can’t remove all of your cancer, in some cases it may be helpful to remove as much of the cancer as possible. Surgery may also be used to remove cancer that has spread to another area of the body. Drugs that use your immune system to fight cancer (biological therapy). Biological therapy (immunotherapy) uses your body’s immune system to fight cancer. Drugs in this category include interferon and aldesleukin (Proleukin), which are synthetic versions of chemicals made in your body. Side effects of these drugs include chills, fever, nausea, vomiting and loss of appetite. Treatment that targets specific aspects of your cancer (targeted therapy). Targeted treatments block specific abnormal signals present in kidney cancer cells that allow them to proliferate. These drugs have shown promise in treating kidney cancer that has spread to other areas of the body. The targeted drugs axitinib (Inlyta), bevacizumab (Avastin), pazopanib (Votrient), sorafenib (Nexavar) and sunitinib (Sutent) block signals that play a role in the growth of blood vessels that provide nutrients to cancer cells and allow cancer cells to spread. Temsirolimus (Torisel) and everolimus (Afinitor) are targeted drugs that block a signal that allows cancer cells to grow and survive. Targeted therapy drugs can cause side effects, such as a rash that can be severe, diarrhea and fatigue. Radiation therapy. Radiation therapy uses high-powered energy beams, such as X-rays, to kill cancer cells. Radiation therapy is sometimes used to control or reduce symptoms of kidney cancer that has spread to other areas of the body, such as the bones. Kidney cancer. Fort Washington, Pa.: National Comprehensive Cancer Network. http://www.nccn.org/professionals/physician_gls/f_guidelines.asp. Accessed Jan. 16, 2015. Niederhuber JE, et al., eds. Abeloff’s Clinical Oncology. 5th ed. Philadelphia, Pa.: Churchill Livingstone Elsevier; 2014. http://www.clinicalkey.com. Accessed Jan. 16, 2015. What you need to know about kidney cancer. National Cancer Institute. http://www.cancer.gov/publications/patient-education/wyntk-kidney-cancer. Accessed Jan. 16, 2015. Distress management. Fort Washington, Pa.: National Comprehensive Cancer Network. http://www.nccn.org/professionals/physician_gls/f_guidelines.asp. Accessed Jan. 16, 2015. Wein AJ, et al. Campbell-Walsh Urology. 10th ed. Philadelphia, Pa.: Saunders Elsevier; 2012. http://www.clinicalkey.com. Accessed Jan 16, 2015. Cook AJ. Decision Support System. Mayo Clinic, Rochester, Minn. Oct. 9, 2014. SEER stat fact sheets: Kidney and renal pelvis cancer. National Cancer Institute. http://seer.cancer.gov/statfacts/html/kidrp.html. Accessed Jan. 19, 2015. What’s New in Kidney Cancer Research and Treatment? Mayo Adhesive Probability Score Is Associated With Localized Renal Cell Carcinoma Progression-free Survival.